Catherine Downes in The Year of Magical Thinking. Photo by Stephen A'Court. Didion’s “writing is heartfelt, it is also incredibly expressive and lyrical, a mark of the great writer that she is. However, as good as this is, it still needs to be brought to life on the stage and this where Susan Wilson’s production makes this into a superb piece of theatre. The simple but effective set of Penny Angrick, Marcus McShane’s subtle but very evocative lighting design and Gareth Hobbs haunting music all add much to the quality of this production, but it is the stand-out performance of Catherine Downes that transcends this production into something special. Solo performances often incorporate multiple characters. Not so this play. Catherine Downes is nobody but Joan Didion relating her year of magical thinking and how Downes does it is masterful. From the moment she appears on stage with her opening lines, reticent, holding back, but powerfully seductive, the audience is drawn into her world where they stay for the duration of the production savouring Downes’ exquisite performance. There are moments of emotion, beautifully handled by Downes, but for the most part this is a rational, sometimes even calculating, way of dealing with loss which Downes portrays with such confidence and ease. Consummate performer that she is, the strength, stamina and ability of someone to perform what is essentially a 90 minute monologue is quite extraordinary. “From the moment Downes appears, a spectre behind a semi-transparent screen bathed in ethereal blue light, she is the character left behind, the one still living. Downes’ face when she steps in front of the screen is one of a woman struggling to hold something back and wanting to release at the same time. “It will happen to you. That’s what I’m here to tell you,” she says. 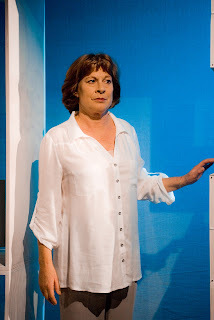 “As the audience rises to applaud Catherine Downes' solo effort, the wonder of it is she has made her 90 minute marathon seem effortless: such is the centred fluency of her beautifully paced and modulated performance, directed by Susan Wilson. The Year of Magical Thinking is on until 8 September. To book, call the Circa Box Office at 801-7992 or go online at www.circa.co.nz.